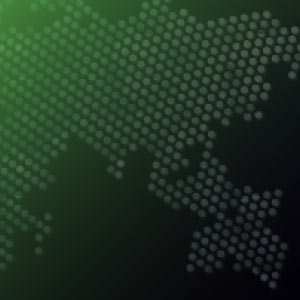 WASHINGTON, D.C. -- The United States' and European Union's economic sanctions against Russia are finding little support in Greece, where the country remains popular, and the loss of trade has hurt the already fragile economy. The majority of Greeks (62%) surveyed shortly before the EU extended sanctions in late June say they do not back the United States' and EU's punitive measures against one of Greece's major trade partners. Russia's retaliatory ban on EU food imports -- which it took the additional step of publicly destroying earlier this month -- has dealt a significant blow to the Greek economy. Before the sanctions, Greek agricultural exports to Russia made up 41% of all Greek exports to Russia, worth approximately 200 million euros annually. 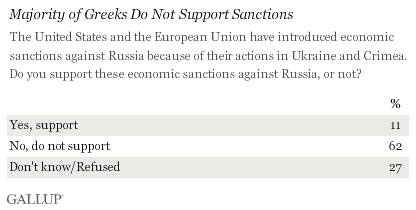 Nearly half of Greeks (45%) believe that the economic sanctions against Russia have negatively affected Greece's economy, while only 5% say they have had a positive effect, and 25% say they have had no effect. But on a personal level, far fewer Greeks (26%) say the sanctions have negatively affected people like them, and a slim majority say they have had either a positive effect (6%) or no effect (45%). Greeks with more education are more likely than those with less education to have an opinion about the sanctions, and they are more likely to oppose them and see them as bad for their national and for their personal economic situations. Greece's coalition government voiced its criticism of the economic sanctions against Russia ahead of the extension in late June, but in the end did not block it -- despite pressure from Russia. With support for the ongoing sanctions crumbling in Greece and other EU countries that have also taken an economic hit, the future of the sanctions in 2016 is unclear. Much clearer is the Greek public's lack of support for measures that have likely dimmed their country's hopes of ending its economic troubles anytime soon. As many in Europe and the West are wondering whether Greece's new government will pivot toward Russia or the EU, Gallup surveys from 2014 show Russia's leadership finding more favor with Greeks than the EU's leadership.